So we lost the Rugby World Cup, and now conveniently we are required to head across the ditch into enemy territory. Awkward timing for Australian V8 Supercars. Here's hoping all will be forgotten, as we know our rival neighbours with strange accents are massive fans of our V8 Supercars Championship and our drivers are massive fans of racing at Pukekohe Park. Over the years one man has been the King of NZ, I am surprised they haven't put his face on their flag by now, or at the very least on a bank note. Now Greg Murphy has swapped a steering wheel for a microphone, the four guys in the field are fighting for that honour. So who is shaping up to be the next guy to have a pie named after them and be King of the Kiwis? 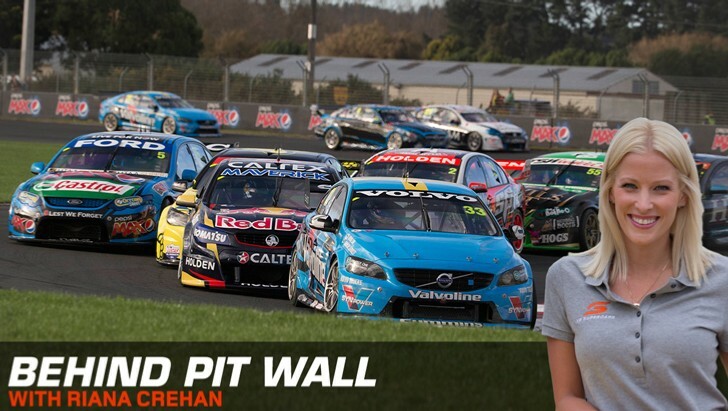 Shane van Gisbergen the drifting superstar? Scott McLaughlin, the youngest ever V8 Supercar winner? Fabian Coulthard currently known for consistency and style, or the young up-and-coming Andre Heimgartner, yet to really make his mark? V8 Supercars has been visiting Pukekohe since 2001. The current cross-Tasman battle stands at New Zealand with 11 wins from three drivers and Australia 18 wins from nine drivers. Technically we have the most but if you average it out, the locals have the advantage. Credit must be given to my pit lane buddy Murph - nine wins and two Pole Positions, basically Teflon around this place in his time. It's an amazing record at a circuit that many describe as one of the fastest and most difficult they race at. It's not just championship points that drivers are racing for this weekend, it's outright honours to claim the Jason Richards Memorial Trophy, awarded for the most points accumulated across the races. The format is slightly different this year to last year as we switch to back to sprint mode - two 60km races Saturday and one 200km on Sunday for this round and next - before the biggrand finale. It was almost scripted in the inaugural year with the trophy going to Team BOC and Jason Bright and then last year Mark Winterbottom took it home as well as the Championship lead early in the year on ANZAC Day weekend. Maybe a change of date, and with a bit of World Cup momentum, we might see it go home in the hands of one of the 'local' lads? My question prior to the Castrol Gold Coast 600 was could Craig Lowndes do it?Well, he certainly gave himself a lifeline by slicing a solid chunk of points off the man he is hunting down, bringing the all-important gap down to 258 points. Much to our spectators' delight he isn't going down without a fight and with 900 points on offer it's game on. However, he has competed in every single event at Pukekohe since day one and is yet to score a victory - in fact, Triple Eight as a team has had little success at the venue, with one win in total delivered by Whincup in 2013. Prodrive has been strong, as mentioned before Frosty took home the JR trophy in 2014 with both cars on the podium and they were winners in 2013 through Will Davison. Fingers crossed the championship battle beefs up over the next couple of days, CL has momentum but Frosty has circuit form and the lead. Hunter versus hunted. Red versus blue - whichever colour you favour, we want them both punching hard to keep this fight going deep into the final weekend of the season. Pukekohe Park Raceway is a track that drivers rave about - it's fast, bumpy and it's a place that V8 Supercars look like they are absolutely on the ragged edge, a place where bravery gets rewarded. This year is the first time we will get to see soft tyres being used. As long as the weather stays dry, this mean serious commitment and fast lap times - look out for lap records tumbling in the second qualifying session on Saturday. Tyre life is also important here - in the past we have seen left rear tyre failures destroy the races of Winterbottom, Whincup and Reynolds. With mandatory tyre pressures and soft tyres, those who can get the most out of those black round things will find themselves in a good position towards the end of the race. - It's on for the teams Championship. It's the background battle that means much more then people give it credit. HRT versus Red Bull is tight for second place.